The image below is a panorama of the villages of the Queyras: Abriès, Aiguilles, Arvieux, Ceillac, Château-Ville-Vieille, Molines, Ristolas and Saint-Véran. From its source on monte Viso, the River Guil tumbles down to Guillestre and the River Durance. It flows through the villages of Ristolas, Abriès, Aiguilles-en-Queyras et Château-Ville-Vieille before entering the gorge of La Combe below Montbardon. Near Abriès the Guil is joined by the waters of Le Bouchet on the right bank, and at Aiguilles those of the Peynin valley on the left bank. At Ville-Vieille, at the junction with the Aygues valley, it is joined by the Aygue Blanche which flows down from Saint Véran, the highest village in Europe, where ‘the roosters peck at the stars’) which has already been joined in Molines by the Aygue Agnel, coming comes down from the Col Agnel. Then lower down it is joined by a tributary from Arvieux which has its source at the Col d’Izoard. Finally, the Guil merges with the Cristillan, a mountain stream from Ceillac, (as if the river needed added strength to push its way through the gorges above Guillestre!). As so often, geography helps to explain history. The valley of the Cristillan stands apart from the basin of the upper Guil, and for this reason Ceillac was isolated from the Queyras until recent times. And then, when you remember that the road along the Guil was not built until 1855, you can understand that the Queyras was isolated for a long time. The average altitude in the Queyras is almost 2,000 metres, and more than half of its inhabitants live above 1,600 metres. 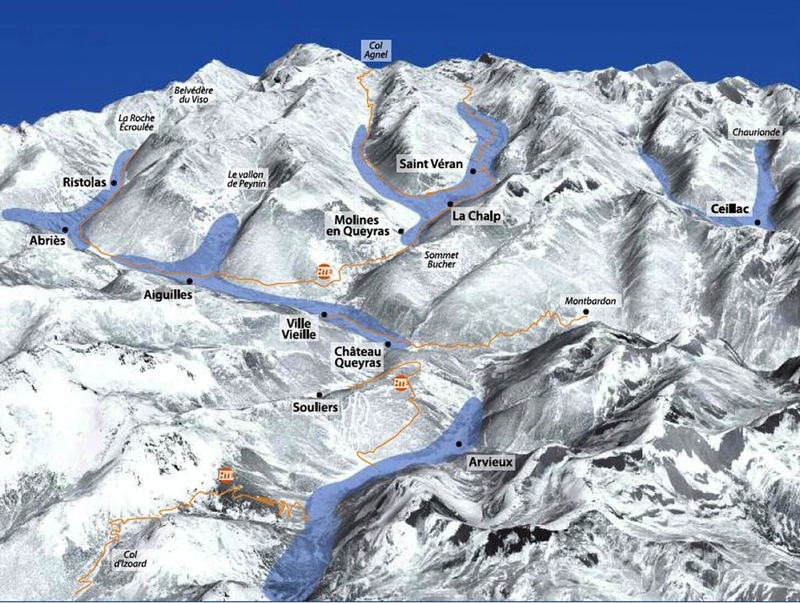 The best way to get a high-altitude view of the Queyras is to climb the Sommet-Bucher (2,254m). The all-round panorama from the summit reveals the whole of the Guil basin and the most distant Alpine peaks.